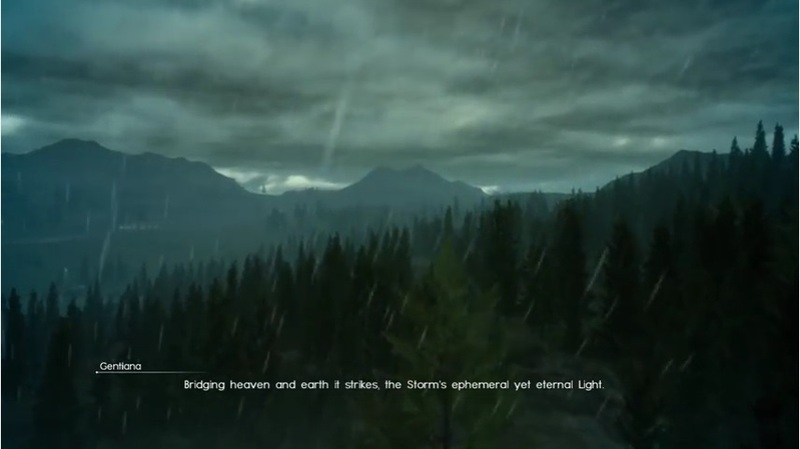 This page contains a detailed walkthrough of Chapter 5 – Dark Clouds in Final Fantasy XV, including quests, objectives, items, enemies and bosses encountered in the game. The chapter begins several days later from the last encounter with a report coming from Ravus Nox Fleuret. 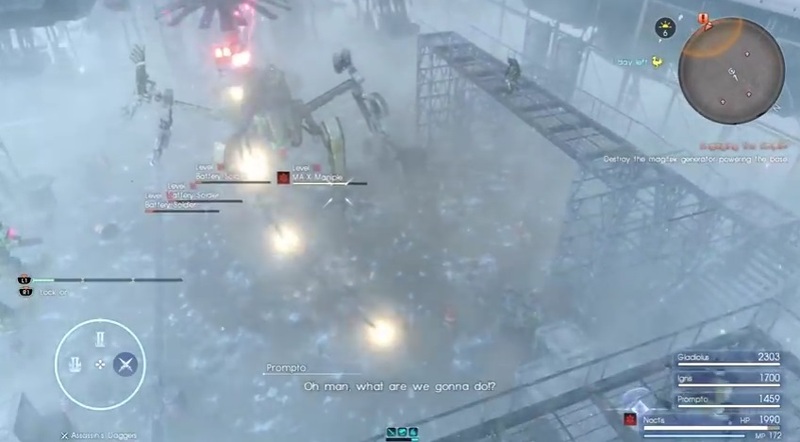 Because of the citadel being attacked, he increased the security at the blockades to stop Noct and the gang at Duscae. He apologizes for the inconvenience it causes the citizens but tells them it’s for the good of all. While Ravus doubles his efforts, the Empire explains about the earthquakes in Duscae and Cleigne. They mention that it was an Archaean that caused the quakes and that they have put the “unruly” giant to rest. People have confirmed that Titan has disappeared from the disc of Cauthess. Meanwhile, the gang finds themselves stranded while looking for their car. Ignis reassures them that they should wait for Cindy as she asks around the local garages. 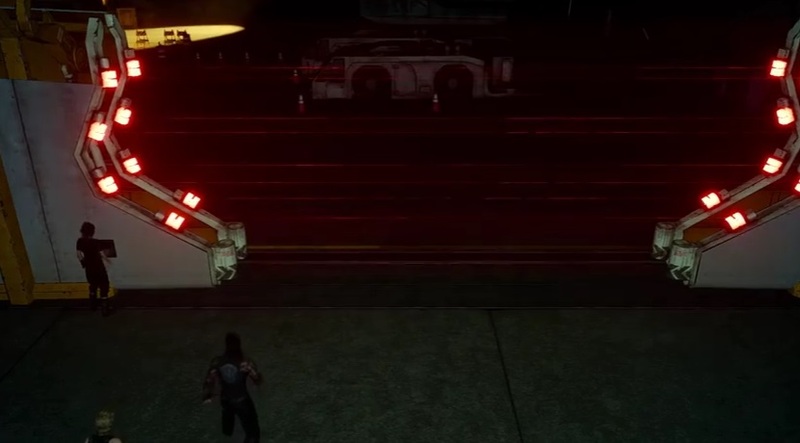 But Gladiolus insists otherwise: the empire has their car. Because your car is missing, this unfortunately means that you’re going to have to do a lot of leg work. 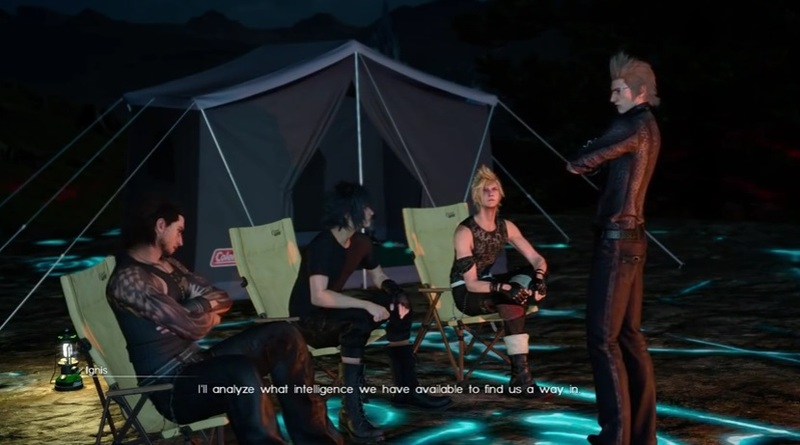 While Prompto suggests that they ask help from the Imperial Chancellor, Gladiolus and Ignis don’t agree with the thought. 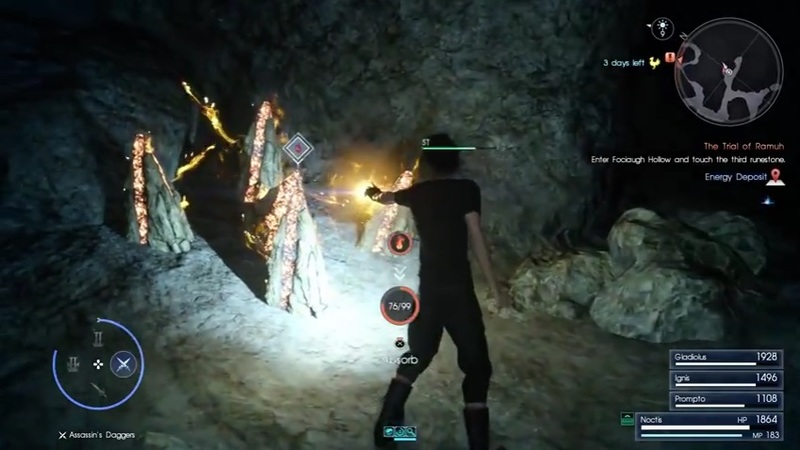 Next Prompto spots Umbra which triggers the first quest of the chapter. First approach Umbra and then follow him throughout the quest. 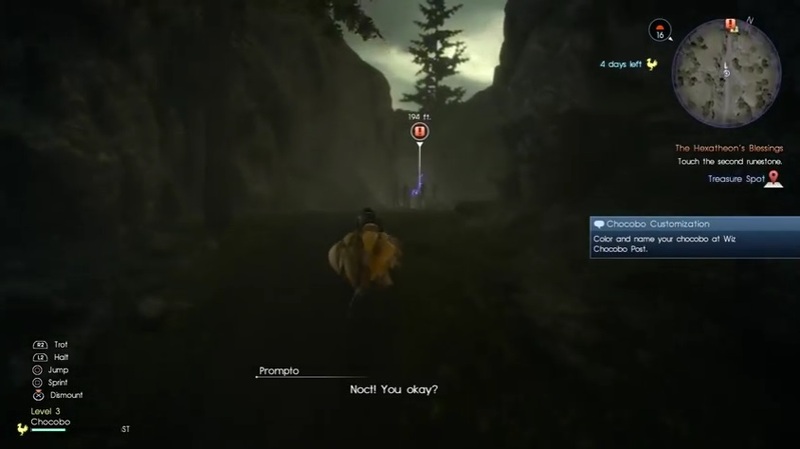 Follow the dog into the forest and then talk to Umbra again to trigger a cut-scene. 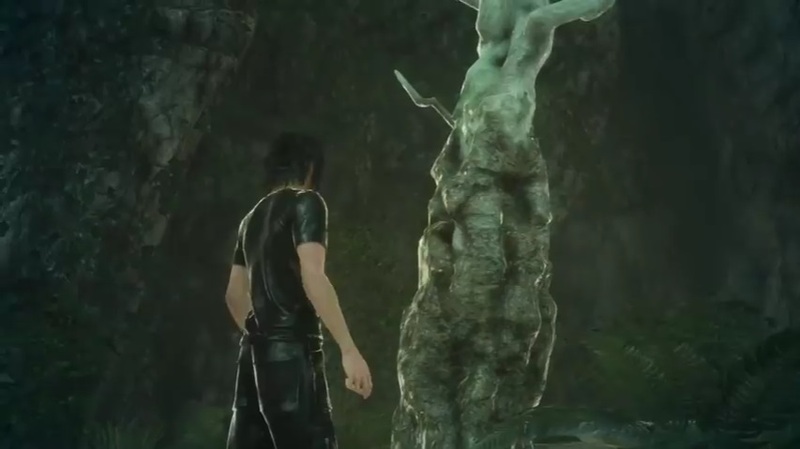 There, Noctis bumps into Gentiana. 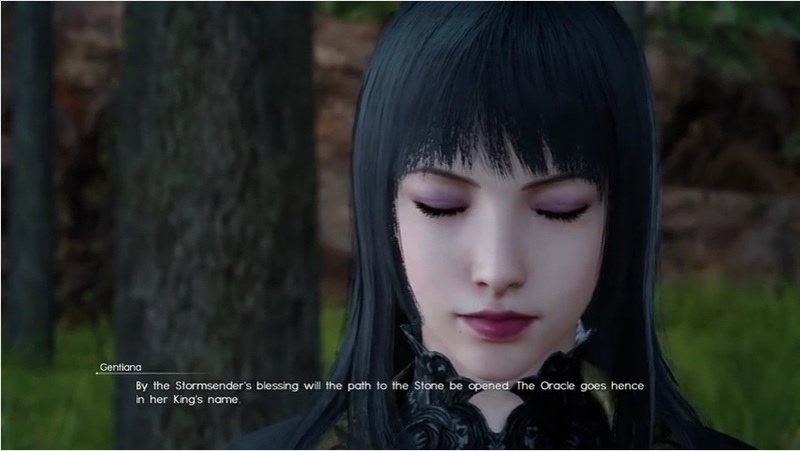 Gentiana speaks to him about the next diety who is known as the Stormsender. 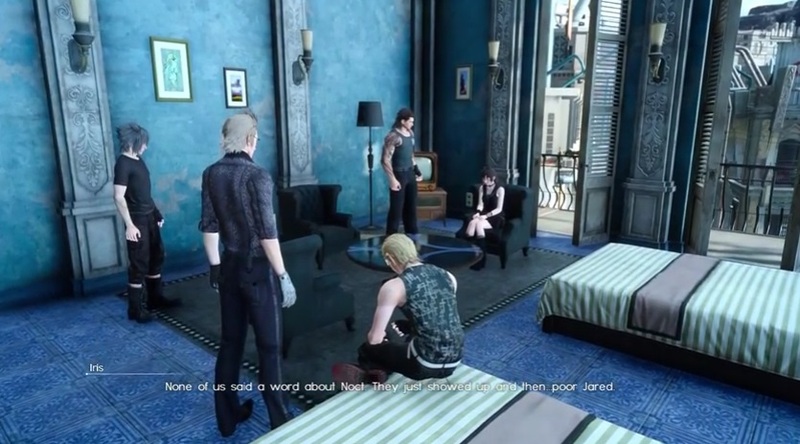 Noctis asks Gentiana where Lunafreya is only to get a cryptic answer: in The Eye of the Storm. She adds that when Lunafreya finishes forging a pact, they will meet at “walls of water”. She also says that’s where Lunafreya will wait for him with the Ring of Lucis. With that, she vanishes. 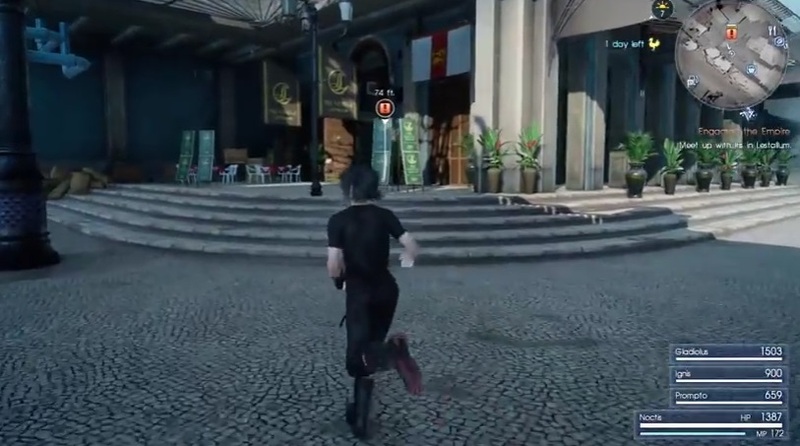 When she disappears, Umbra approaches Noctis with a book. The young prince recognizes it as a book they used to read together as children. After that, choose what to write back to her. Choose the top choice [“I received the blessing. Thank you, Luna”] and Noctis will send it back to her via Umbra. Noct also tells Umbra to reassure Lunafreya that he is okay and that they will be together soon. 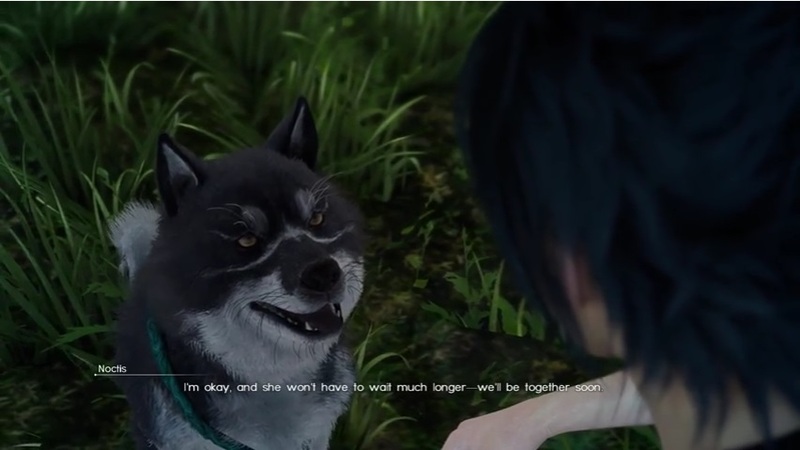 Noct has a flashback about him and Luna. 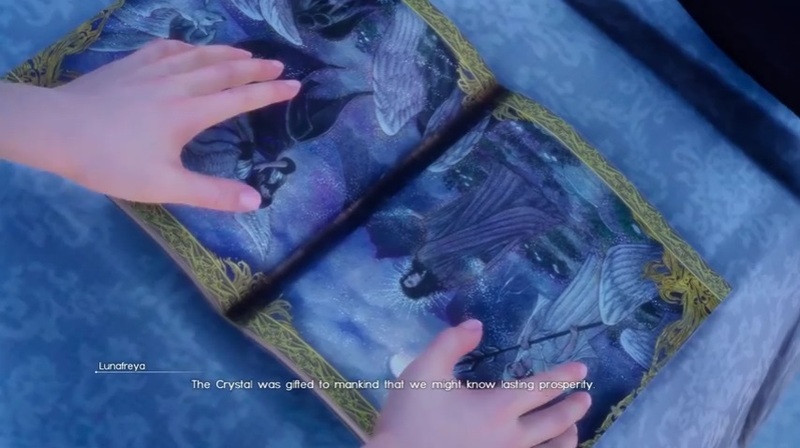 Here, you learn about the origins of the crystal and Noct’s duty to it. It’s also said here that Noct is the Chosen and that only he can purge the star of its scourge. At first, he is doubtful. But Luna reassures him that he can. 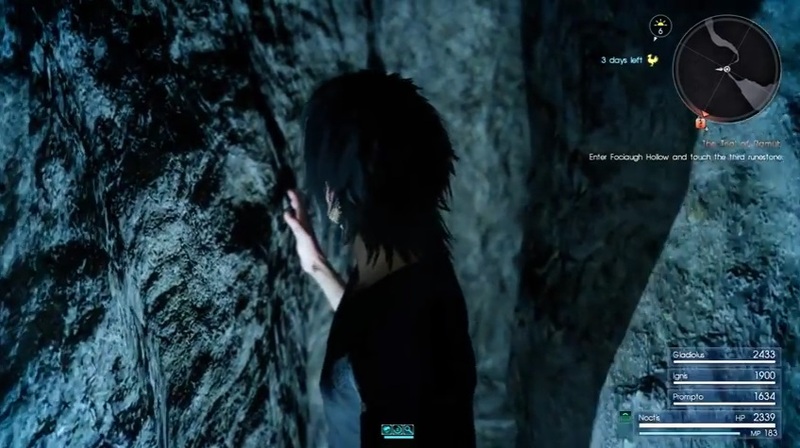 With that, Noct’s flashback ends and Gentiana tells him another prophecy. 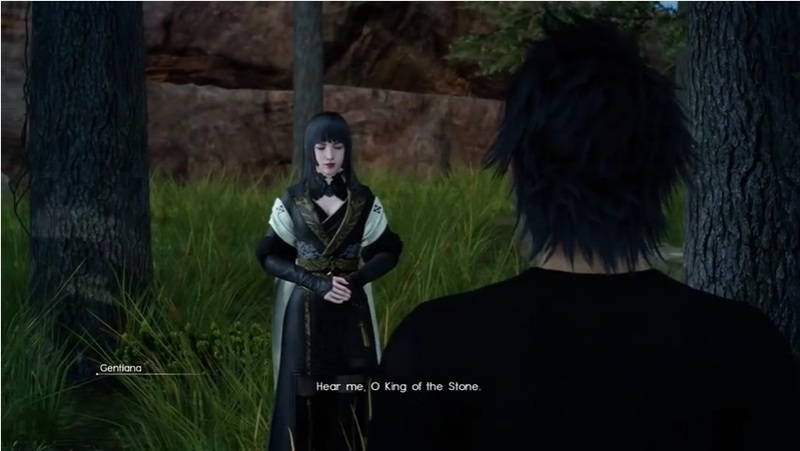 Gentiana says only he can hear her and which she proceeds to tell him the prophecy. She speaks about the storm and the light which bridges heaven and earth. 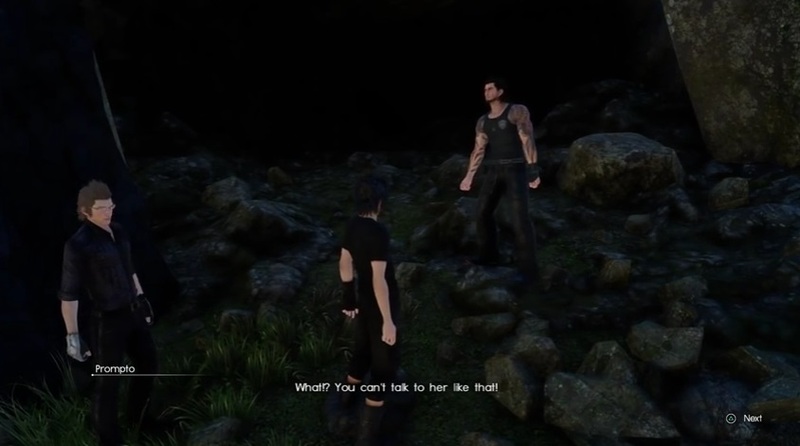 She also tells him that Noct must go to the light. Thus, it triggers the next quest: the Trials of Ramuh. 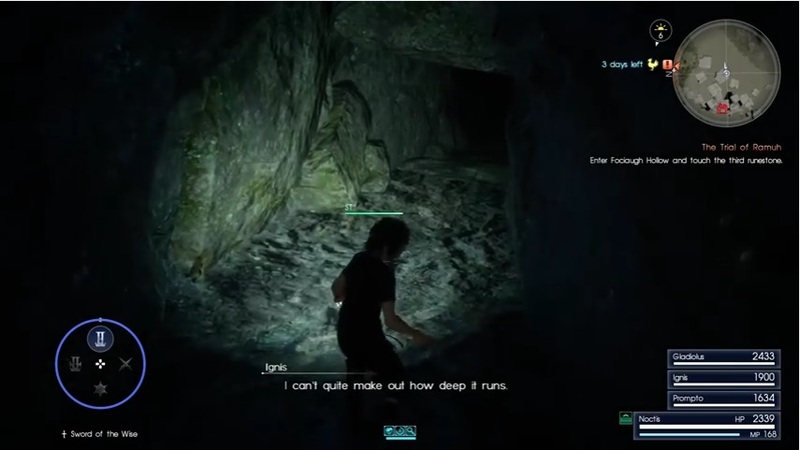 Noct has to go find the three runestone of Ramuh hidden in Duscae. 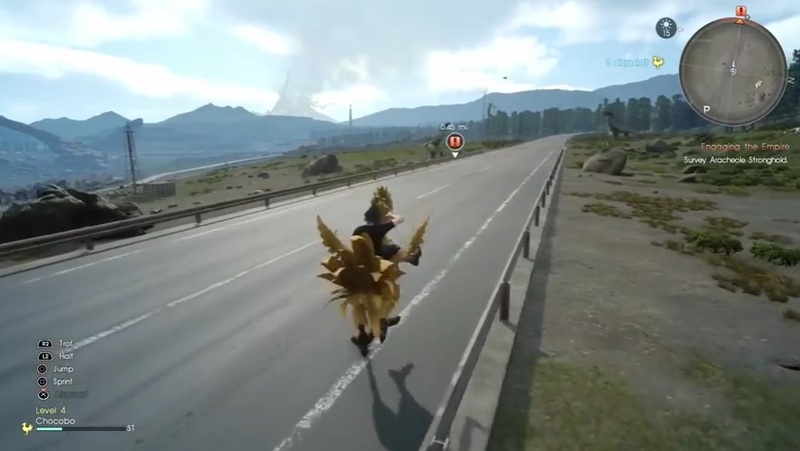 Rent a chocobo to make your life easier. 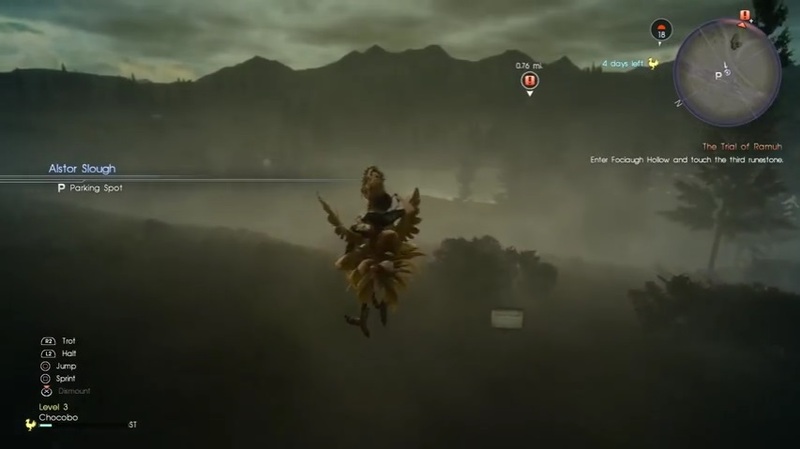 Head north from the Wiz Chocobo Outpost and into the forest. From there, you’ll also spot your quest marker. 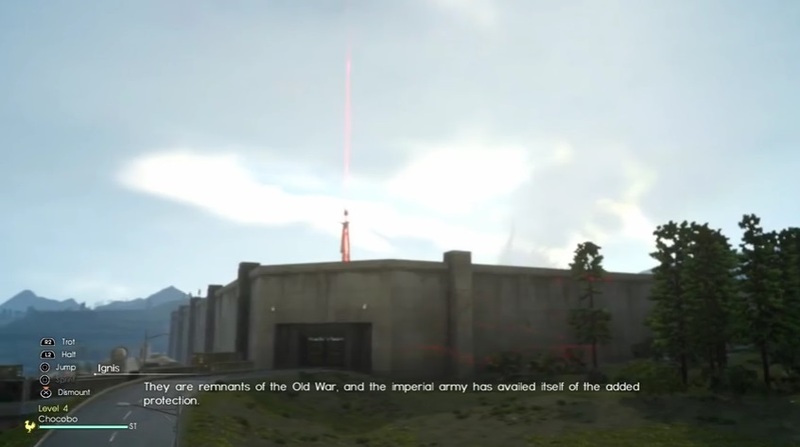 Make sure you watch yourself since Imperial soldiers are on the look out. If they spot you, you’ll be forced to confront them. After that, head closer and you’ll spot a fire magic and ice crystal magic spot. 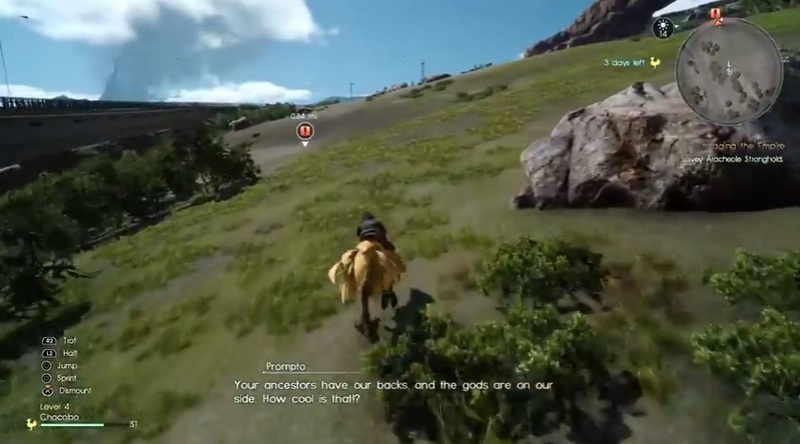 Have the chocobo cross the street and head into the canyon. There, you’ll follow the pathway heading to the first Runestone. When you close in at around 200 metres, there should be 1x Debased Coin lying on the ground. Pick it up and continue forward. When you get there, make sure you clear up the Magitek Soldiers nearby. 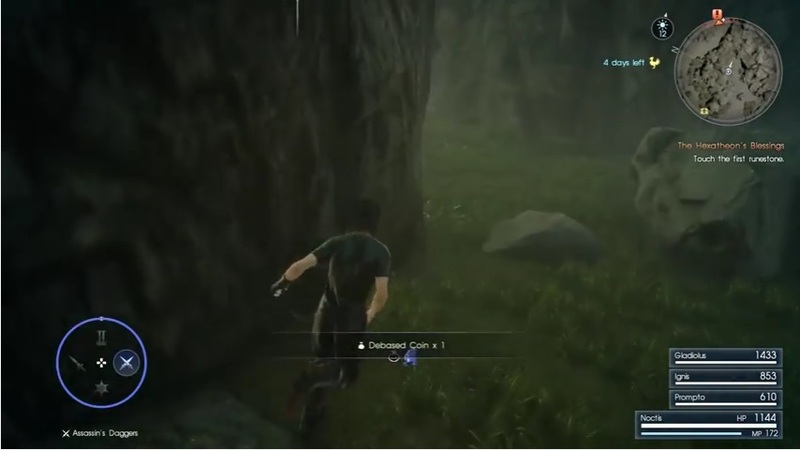 After slaughtering them all, approach the tree where Noctis will approach the first rune stone. With that, he touches the tree with the electricity bursting out and triggering his memories of the past. 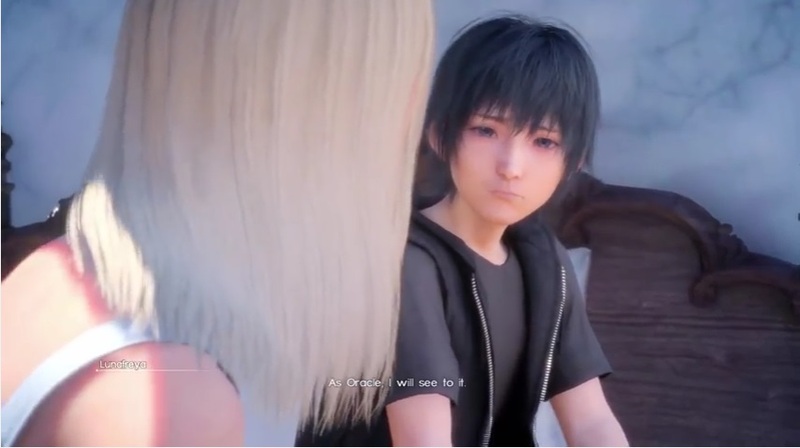 When he opens his eyes, he finds himself as a child and meeting Gentiana for the first time. She speaks kindly about his familiarity with Lunafreya and how the world may depend on it. 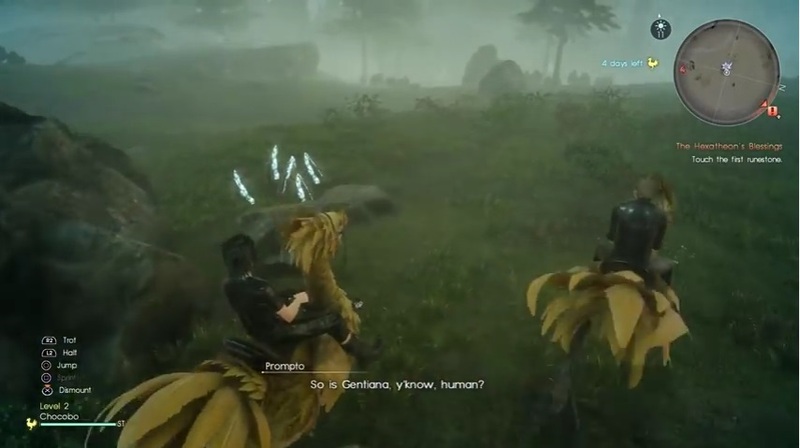 After the flashback, Noctis gets a message from Gentiana about people fearing his ascension. Also, how he should hurry up finding the stones. From the tree, head out to the canyon and follow the road on the map heading towards the quest marker. It should be a long straight-forward road heading towards the next runestone. 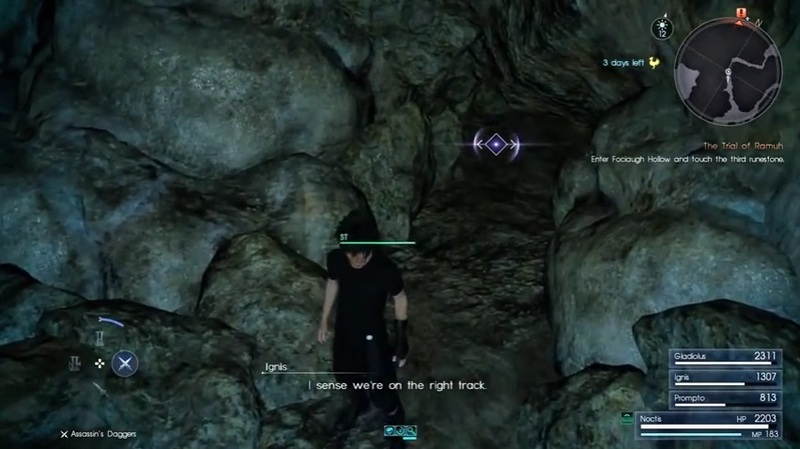 Noct also gets a message that Luna’s already awakening the Six Astrals. Cross the street again and you’ll see Coernix Station. Buy a few potions and healing items before leaving. You never know what could possibly be there. Also, buy a bit of food to boost your stats before you go. 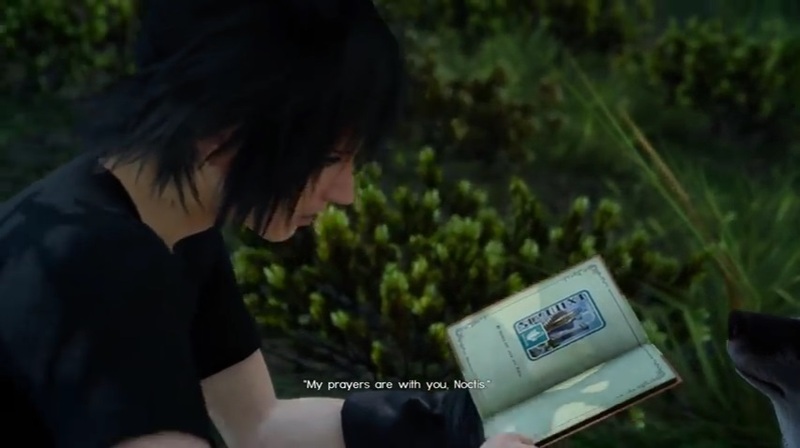 Ignis may also learn a recipe or two while buying food. Continue on until you reach the fence. Hug the fence and follow it down. You’ll reach a canyon area where you’ll get a message that Luna has already forged the pact. It’s all up to Noct now to finish up with Ramuh. 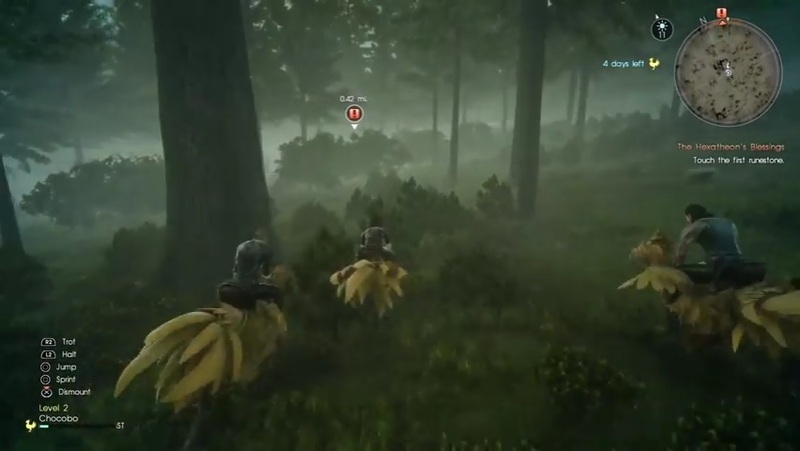 Take down the Magitek Soldiers up ahead and proceed to touch the next tree. Before you approach the next tree, pick up the Mega Phoenix on the right side. With that, you finished the Hexatheon Blessing Quest. 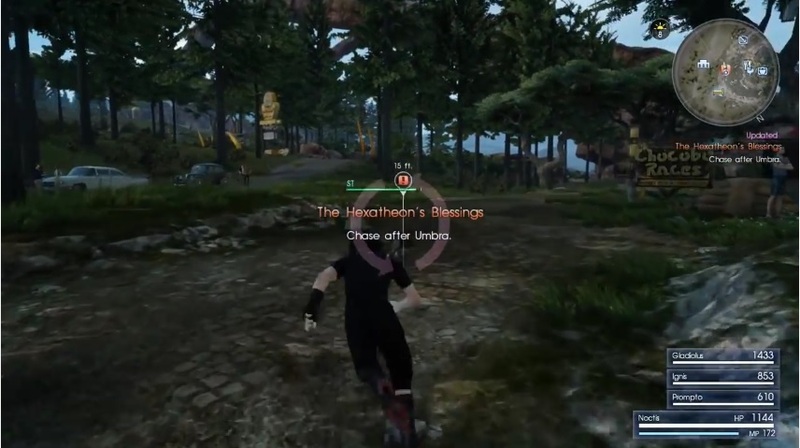 Now that you have the two runestones, Gentiana tells you to head to Fociaugh where you can receive Ramuh’s power. 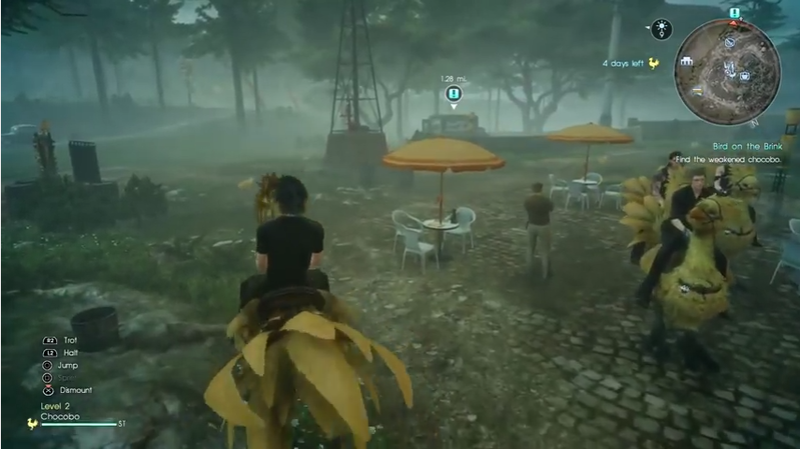 For this quest, approach the table where Noct will talk to one of the farmers. 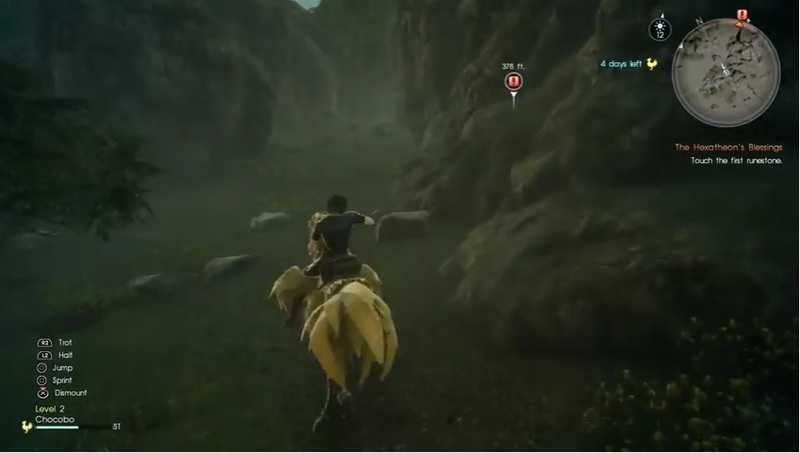 The farmer will mention that there is a sick chocobo out there and he wants Noct to bring it back. The prince agrees to the quest should you approach the table. After that, open the quest menu so you can mark your map. 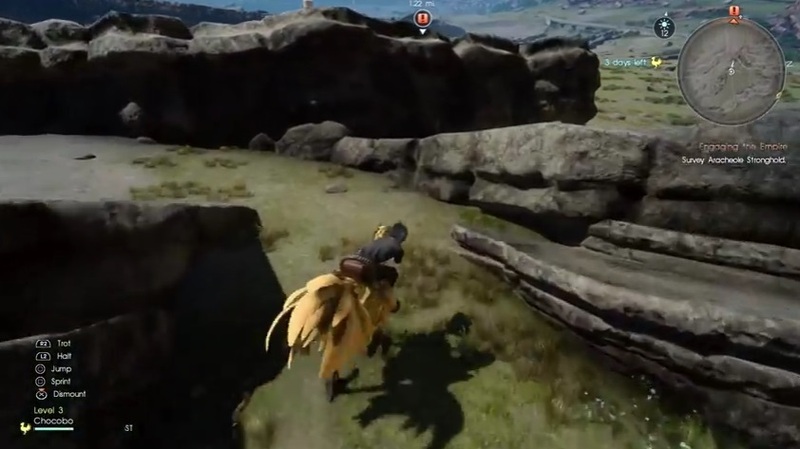 To make things easier, you can rent a chocobo for a few gil. 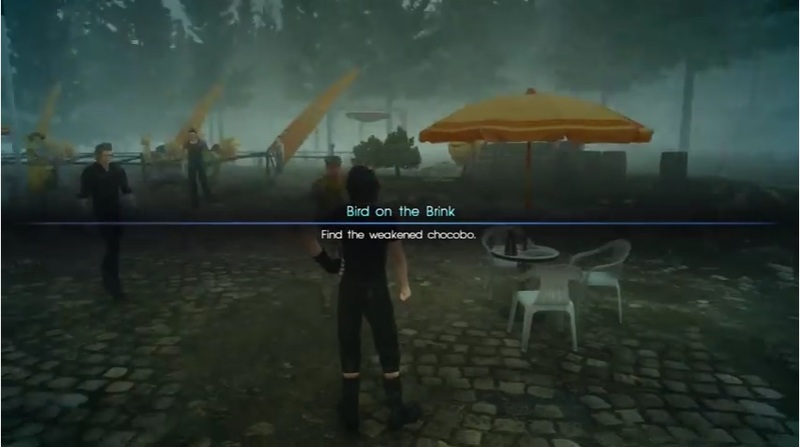 Pick up some medicine if you don’t have any and head south to pick up the Chocobo. After you finish up with your quests, head over to the cavern. Remember the cavern with all the goblins in Episode Duscae? That’s the cavern where you find Ramuh. Follow the quest marker and head north from where you’ve come from. You should be passing through Altor Slough before hitting the caverns. Follow along the road again after taking out a few creatures for some materials. There should be street lights lining the street. After that, you’ll spot a Behemoth Horn – reminiscent of Episode Duscae. Before you go into the caves, there will be a few magic crystals there you can extract energies from so fill up on fire, ice, and thunder. There, you’ll also find a camp site where you can kick back and relax for a bit. After that, you’ll find the canyon you’ll get into with a lightning splitting the rock blocking the cavern open. Go into Fociaugh Hollow to find Ramuh. Go deeper into the caves and in the first room, there should be a fossil shell lying around there. Next, squeeze through a tiny opening there in a cavern. Follow the pathway through the map and slaughter a few imps on the way. After that, pick up the Fossil Wood lying on the ground before proceeding further. When you’re done clearing up the area, there will be a small hole that you crouch through. After that, you’ll find yourself near a garden where a couple of imps may pop out. Take out the imps and grab the Oracle Ascension coin before going further. Harvest some of the Allural Shallot to give Ignis a new recipe to work with. Follow the pathway straight down until you get to a fork road. After the battle, pick up the fossil wood lying on the ground. Go through the right path first to pick up one fossil wood. Either path leads wherever so you can choose where to go. Reach the end of the path where you’ll come across another fork road. Make a right where you’ll spot the Fire Crystal to draw magic from. Head over to the other side and pick up the Rusted Bit. After that, proceed down the cavern where you’ll come up with two paths. Take one path and pick up the Magic Flask. There should be an ice crystal nearby where you can also draw out ice magic. After drawing the magic, proceed to the wall where you can squeeze through. Squeeze through the hole and have a whole zerg of imps come at you. When you’re done beating them down, squeeze through the hole and pick up the Ammonite Fossil on your way out. 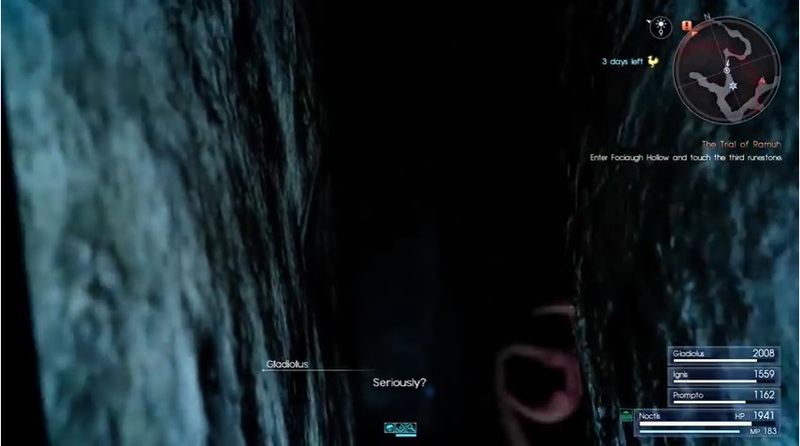 Suddenly, you hear a loud growl that spooks Prompto. 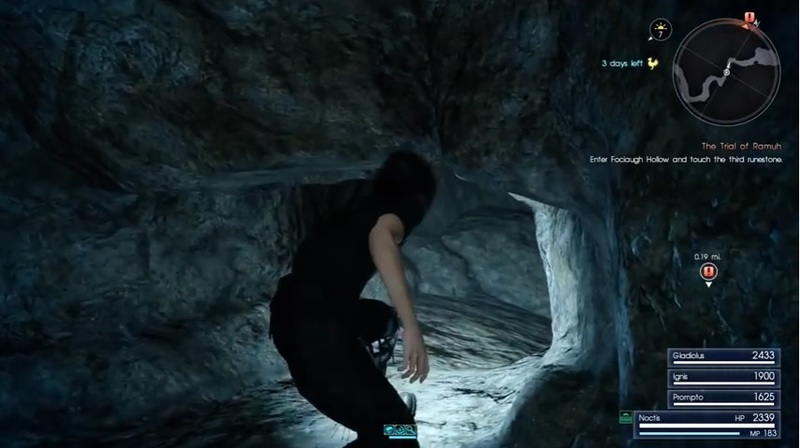 At first the group ignores it but when Prompto gets snagged, you have to go look for him. Follow path downward where there will be warp points. 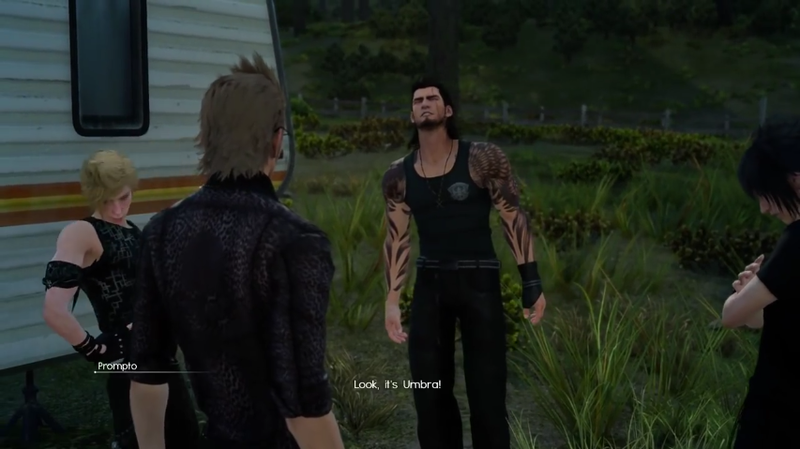 Gladio asks if Prompto is okay but gets a no for an answer. Warp down and take out the monsters within the vicinity. After you’re done, proceed on. There will be a cross-like path which you’ll have to go through. Take the one with a place where you have to crouch and crawl through. Before you enter, pick up the Ancient Dragon Tooth on the ground. Make sure you double check any of the pathways. One of them has a Debased Banknote, which you get by going through the tunnel hole. There’s a Blue Choker also lying down a pile of rocks when you head west. When you’re done, crawl through the hole. 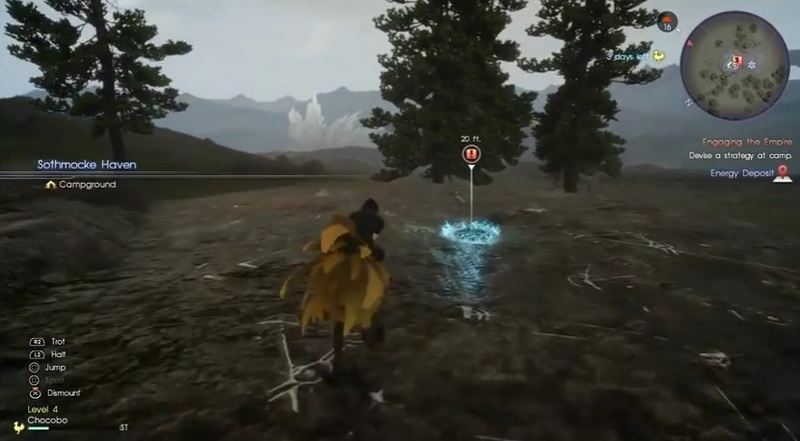 After going through the hole, pick up the Lightning magic from the crystal and follow the path down. You’ll end up in a big area that has two pathways. One has a tiny pathway that you have to crouch through and the other one is you walk through it. The one where you crawl has a vault in it which you need a key to get in. 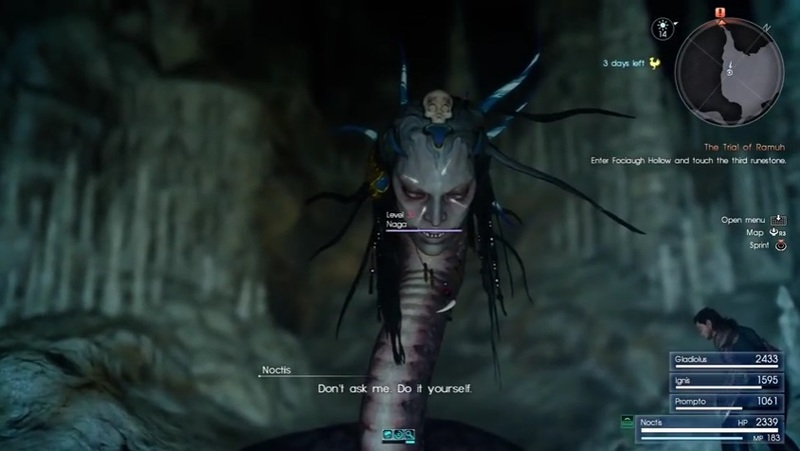 Leave and go to the other path only to cross the Naga that kidnapped Prompto the first time. She first asks you where her baby is. Either answer, you end up fighting her. When fighting her, she swings that tail a lot. Make sure you keep a distance but at the same time don’t lose track of her. Use your Warp Strike skills to keep track and also load her with spells if you can. She’ll dive around a lot but as long as you keep your Warp Strike skills and know how to use your characters, you’ll be fine. After the boss fight, head down the cavern where your quest marker is and you’ll find the final runestone. Touch it and let the cut-scene unfold. After that, you’ll receive the Mark of Fulgarian and finally finish the Trial of Ramuh. 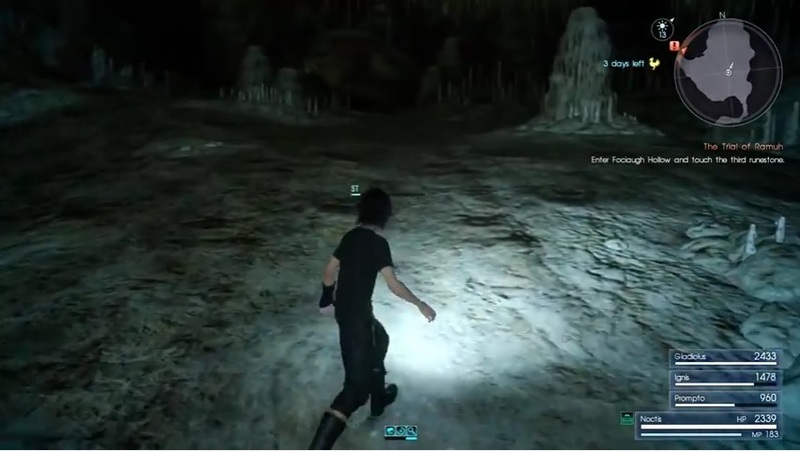 After they leave the cave, Noctis finds out that their car is in an Imperial Base from Cindy. He thanks her and puts the phone down. They then decide to find their car at the Archeole Empire Base. Time to survey the base. Head towards a rock and pick up the Silver Shard. Run near the cliffs and find some Alstrooms. Climb up one of the ledges and pick up the Capatoblepass’ Fang. Run North from where you are and pass by the Wiz Chocobo Outpost and sell the stuff you picked up. Also, don’t forget to pick up a few potions and phoenix downs on the way. With that, continue heading north. If you see a train and a large horned creature, you’re on the right track. Follow the road and cut across the plain. After awhile, you’ll hit the road again where you finally reach the fortress. After reaching the fortress, head off to Sothmocke Haven to make camp and devise a strategy on how to get in. As the camp starts, feed your members and Ignis will come up with a strategy. Frontal Assault leaves everyone exposed so there will be a night infiltration mission for the car.Until then, find information as to where the car is. Hug against the large bins and move in. After awhile, Ignis gives you the signal when to warp-kill. When you kill the two soldiers, you get 2 AP. After that, avoid the search lights and stick close to the large storage boxes. Warp-kill the next 3 Imperial Soldiers before warping off to another position hidden behind the storage. There, you’ll find also a laser gate. Open it and enter inside. After that, sneak in and warp-kill the next 6 soldiers. Use the terrain to your advantage especially when warping around. There are a few towers you can use to get around and get a good view. There’s a tanker that you can warp to in order to get to the gate. Warp towards one of the tankers and open the next laser gate. 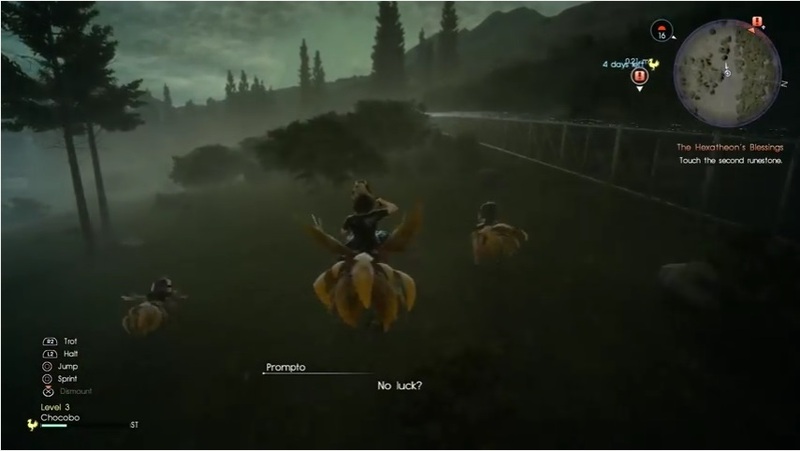 After opening the gate, go to the control room and pick up a Magitek Booster before proceeding on. There’s also a hangar you might want to check out in case there’s anything and also the scouting tower for the Mega Potion. Follow the quest marker and make your way to the Regalia where you’ll trigger a boss battle against the Max Machine. Just like the battle between you and Loqi. Attack its legs and swing around to prevent yourself from getting stomped. Use magic when necessary and keep healing. 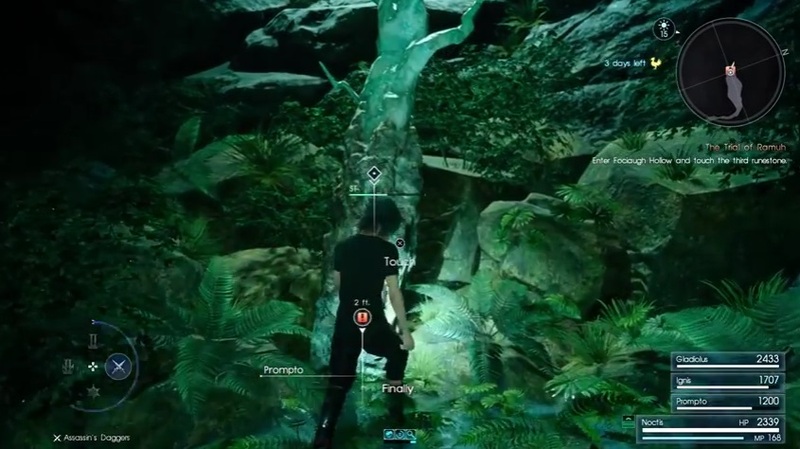 Have you and Gladio tank most of the damage while Prompto and Ignis hang around for a in and out. Make sure also to take advantage of the multiple towers where you can warp in and out of. Battle your way through the troopers and have the cannons blow up the tanks. 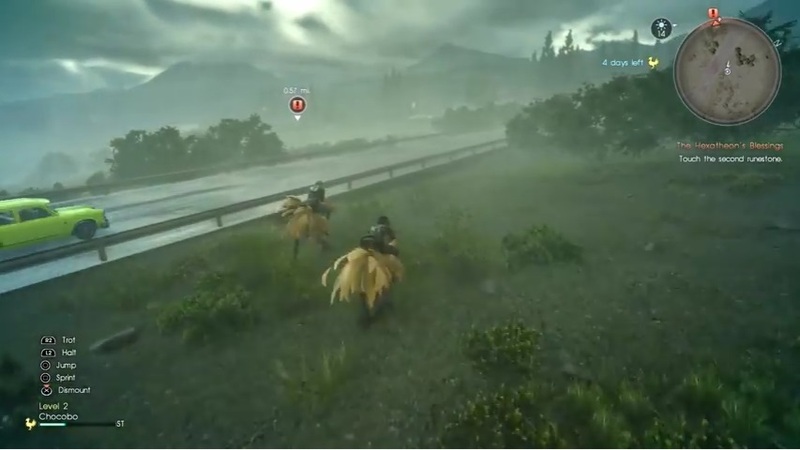 When you’re done clearing them out, Ignis will tell you to blow the generator to weaken the soldiers. Warp towards two tanks where you’ll see another laser gate to open. Go in and use the cannon to obliterate everything before making your way towards the generator. Once you’re at the generator, bust them down with quck AoEs. A Blizzara should take out the soldiers. Take them out and handle the machine after. 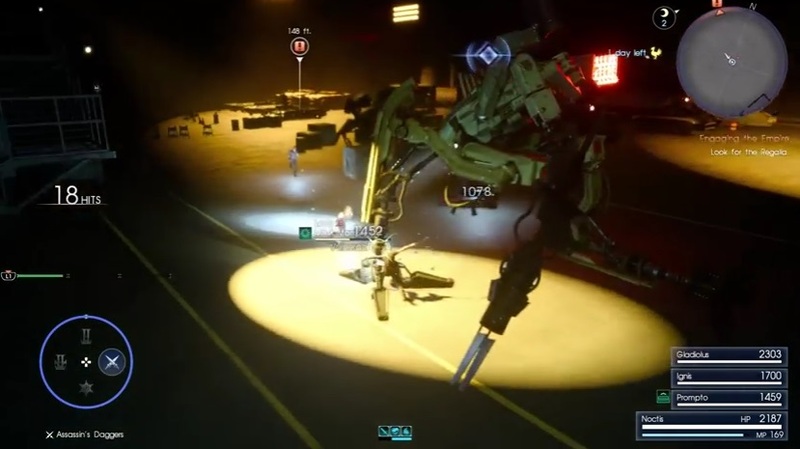 Like any big opponent, swing around its legs and let Gladio tank. 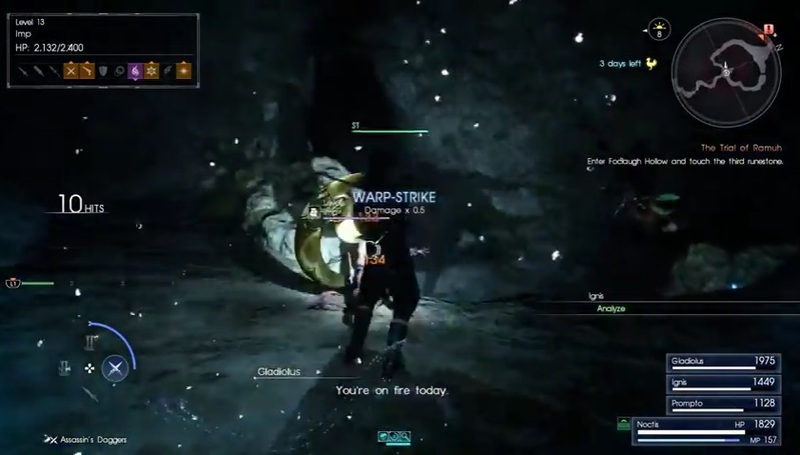 Swing in and out and heal Ignis and Prompto when necessary. 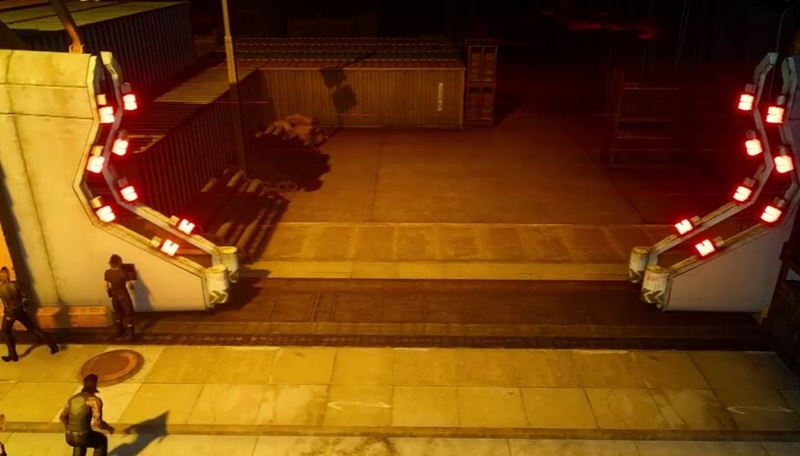 When Gladio’s tanking, you have the more important job: blowing the generator to pieces. Destroy the generator and then summon Ramuh to crush the entire base. After blowing up the entire base, head out the same way you got in. Explore the base a bit and pick up a Reflex Enhancer around the area. When you’re done sweeping the place, get to the Regalia and get out of the base. 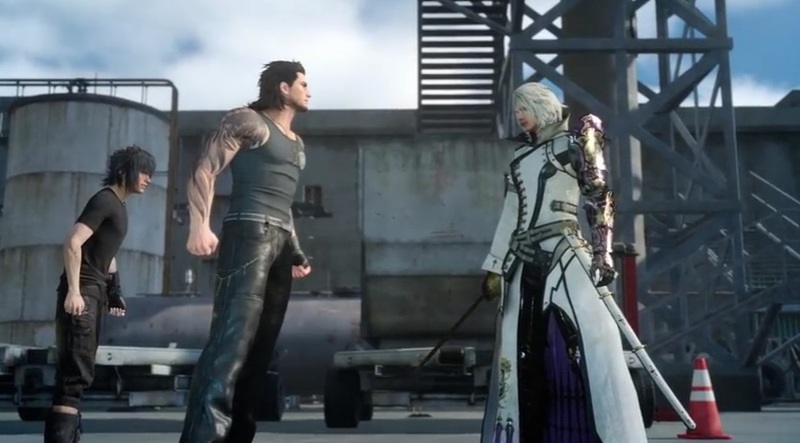 But before you can do that, Ravus shows up and picks a fight with you guys. 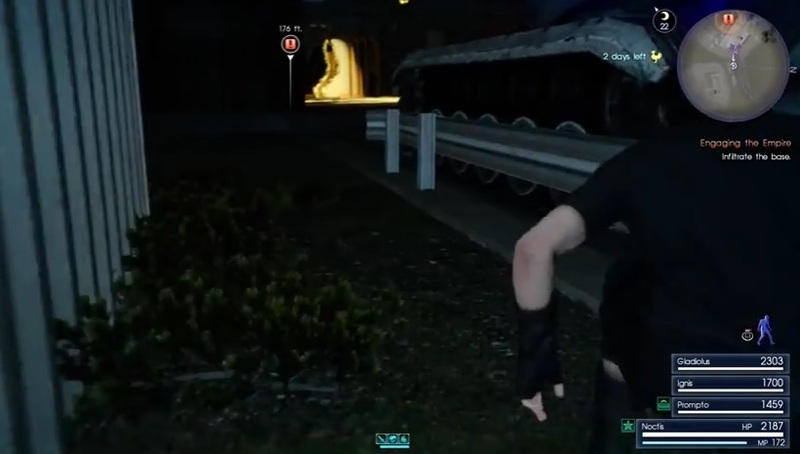 He points a sword at Noct and kicks Gladio against the Regalia. 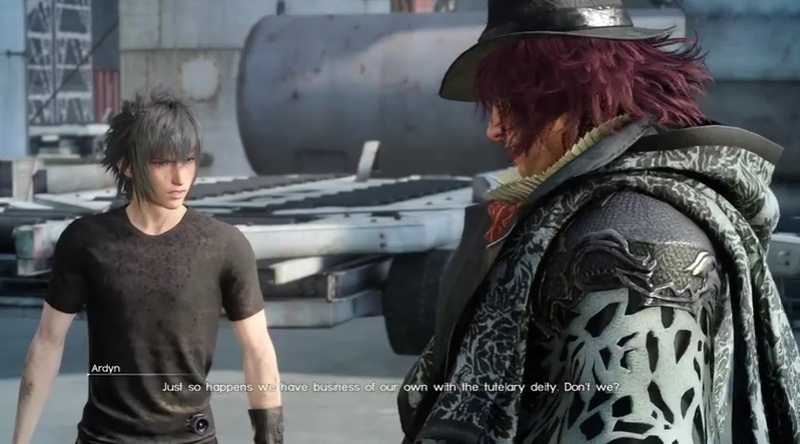 Furious, Noct intends to take him out until they’re saved by the Councillor of Nilfheim, Ardyn. 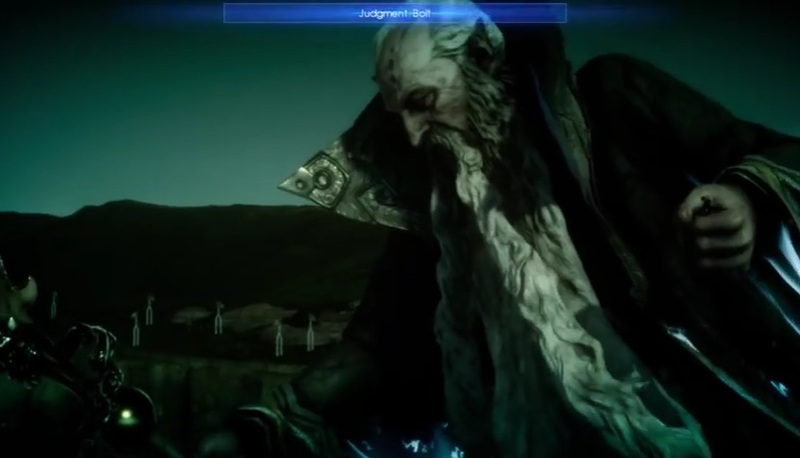 He breaks the fight off and tells Ravus that they have their own deity to find. After that, you set off. It turns out that Ravus Nox Fleuret is the older brother of Lady Lunafreya and has a bone to pick with you. All of you then hop into the Regalia after Ardyn breaks up the fight and head to Lestallum to meet up with Iris. In Lestallum, park the car near the stairs and run across the city. Head into the alleys where you’re supposed to meet up with Iris. Once you meet up with Iris, she reveals that she never made it to Caem. It turns out that the empire raided the city to find out more about Noct. And it turns out that the empire also killed a close friend of theirs, Jared. 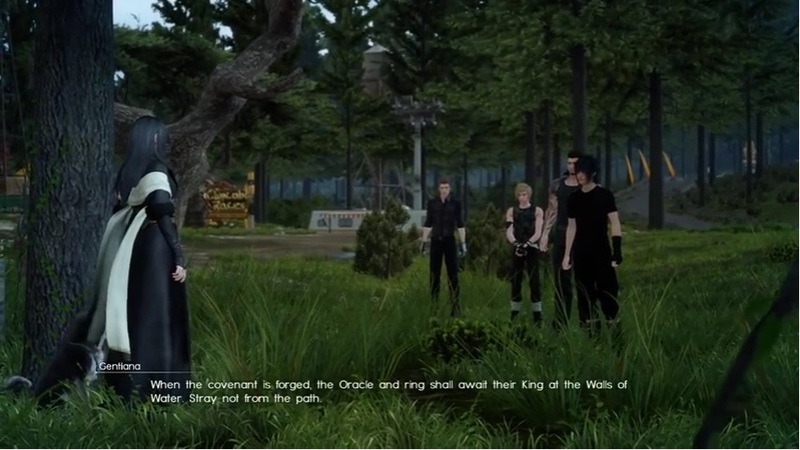 Noctis swears to make the Empire pay for what they’ve done. With that, Iris brings Talcott to Caem while the rest proceed on forward.